Dear students, here is one more important paragraph for high school and college level students. This paragraph is about Gender Discrimination or Gender Inequality, one of existing problems in our society. You must have knowledge about it because it is a common matter in our country. What is Gender Discrimination or Inequity? What are the causes of gender inequity? What are the negative effects of it? How can we change the situation? Gender discrimination means to make difference between men and women. Specially in the third world countries women are considered inferior to men. Though they have merits and capabilities, they are not given what they deserve. They work in the family and outside the family, but their contribution is not seen. There are many reasons of gender discrimination. Firstly, lack of education is responsible for this. Secondly, superstition is also responsible. Thirdly, social view causes the problem. Men and women have been given equal right and position. But men try to dominate women. The female children are thought burden of the family. They are not given equal opportunity for education, equal food and cloths. 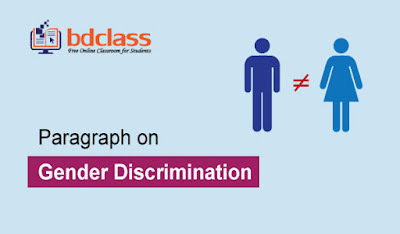 There are many bad impacts of gender discrimination. If we neglect the female, our half of population will remain idle at home. Our social and national development is never possible keeping them idle at home. This is a great problem which must be solved. At first the government should come forward change the situation. We should make public awareness of the matter. Mass media can play an important role in rising public awareness. We should change our attitude about women and never try to make difference between boys and girls.